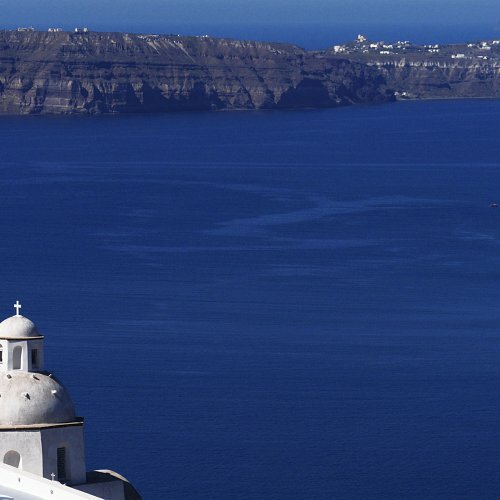 Santorini is situated within the Cycladic group of islands in the Aegean Sea. 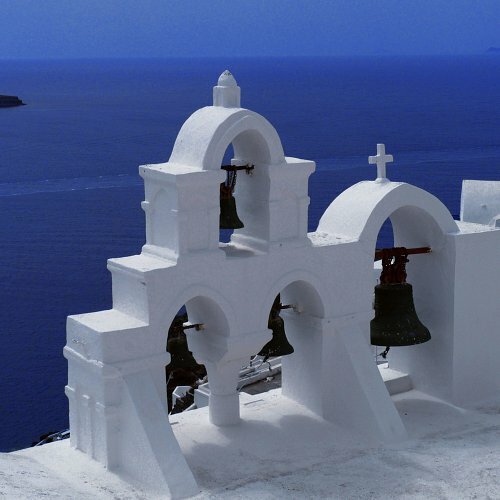 It is a unique island as it combines, a rich eleven millennia history still evident on the island, world-famous wines due to its rich soil, an active as well as a lesser known submerged volcano that have shaped the island, spectacular views of the Aegean sea sunsets and undiscovered stretches of coastline offering incredible swimming in the deep blue Aegean Sea. 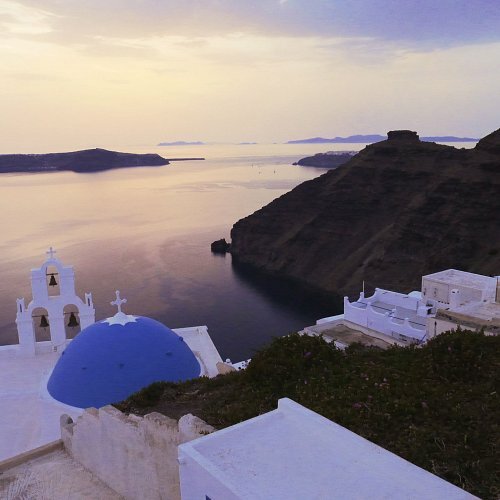 This unique Volcanic Swim trip is designed to give you a complete ‘taste’ of Santorini, from its Cycladic turquoise waters to the secrets of its ancient inhabitants and their artefacts. A swimming experience and more! For this 5-day, approximately 5K swim per day programme, we will greet you at the airport on arrival and take you to our luxurious, 4 star hotel El Greco to relax, rest or immerse yourself in one of the 4 swimming pools or spa. In the evening we will formally introduce you to the rest of the group over complimentary drinks and give you information on the week’s trip. The swim trip will start the following morning with a filmed swimming analysis and coaching from our qualified guides. Each morning we will board our traditional wooden boat and head to a different location around the caldera for a coastal swim with spectacular views of Santorini and its surrounding islands. For lunch we will visit a nearby harbour where local mouth-watering Greek food is freshly prepared. The afternoon swim will take place once we had the time to digest the food and maybe had a coffee and a stroll. The trip starts on your arrival at the airport where you will be welcomed with a free transfer to our hotel. In the evening you will have a chance to meet your fellow swimmers and be briefed on the week’s itinerary over relaxing complimentary drinks. On the first day of the trip our guides/coaches will video your swimming technique for an analysis session. We then view this with you and offer advice on achieving a more efficient, injury-free stroke. Individual advice can also be given during the swims. Each day starts with a rich, buffet style breakfast offered every morning at the hotel; we will then take you in a minibus to the new port to board our boat heading for our 1st swimming location. After the swim we will visit one of the harbours for lunch where we stop and rest for about 1.5 - 2 hours. We then board the boat and we continue our discovery of Santorini by the sea swimming in a different spectacular location.You will also be given a Santorini-themed T-shirt, a water bottle and a swimming hat; we will also visit the volcano and have the chance to walk along the top of some of the craters formed over the last few centuries; a visit will also be arranged for some wine sampling at the nearby Santo Wines whilst enjoying the panoramic views of the caldera. __The start of an incredible journey on land and at sea! Arrival of all swimmers via free transfer from the airport to our luxurious, 4 star El Greco Hotel and Spa in Fira, the Islands capital. Swimmers have the option of having some time to unwind by one of the four swimming pools, a drink at one of the pool’s bars, some fitness work in the gym or even have a relaxing time in the spa! In the evening we all meet at the hotel’s pool bar and formally welcome you to this amazing island. Complimentary welcome drinks give you a chance to get to know your fellow swimmers and this is followed by an introductory briefing to the trip by our Santorini based team. Today kicks off with an initial open water acclimatisation swim and optional swim analysis session. 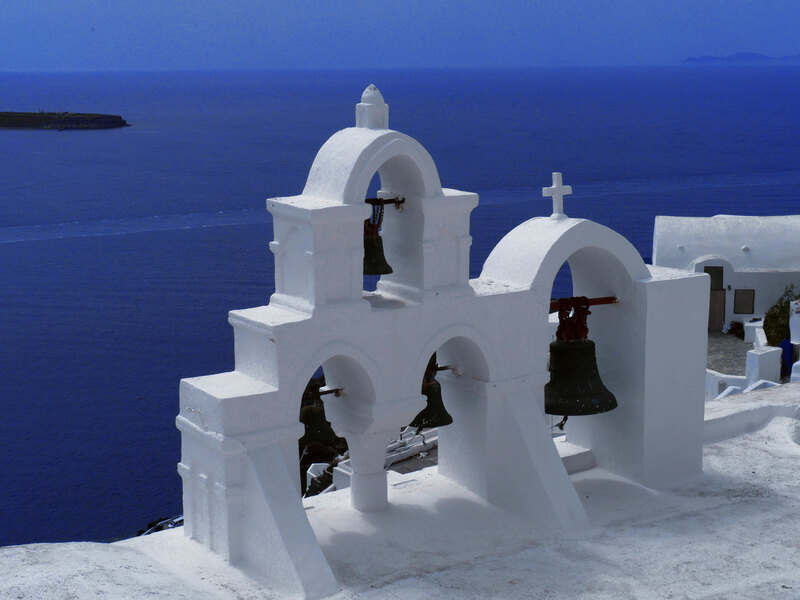 This is your chance to meet the breath-taking deep blue waters of the Aegean Sea and immerse yourself in the spectacular setting of Santorini. Our swimming introduction will take place against the backdrop of the imposing volcano. Our qualified coaches and guides will split the week’s swimmers into 2 speed groups, we will then film each swimmer and later provide feedback on technique. Swimmers then board the boat and take a north direction to the island of Thirasia and moor at Korfos harbour, a chance to experience traditional Greece on this untouched island. 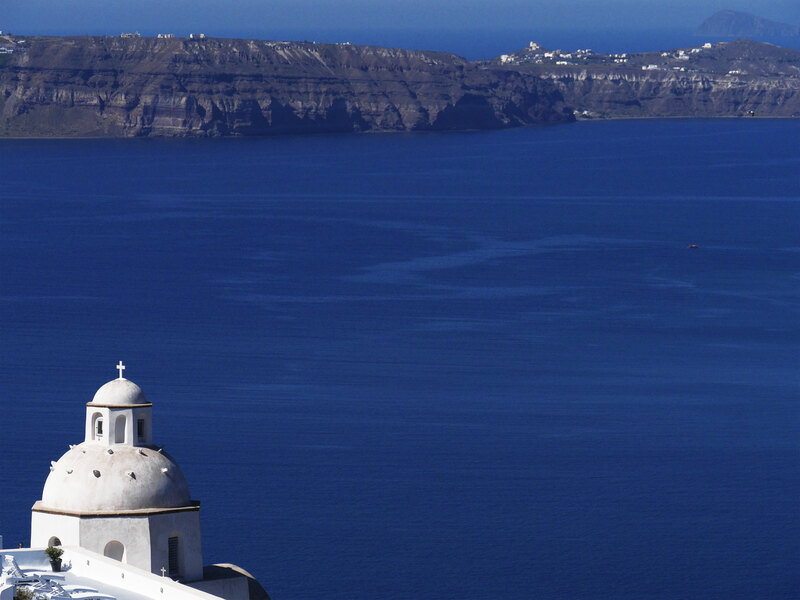 From there the panoramic view opposite of the hanging cliffs of legendary Santorini with its Cycladic, iconic dwellings, are there in all their glory for you to take in. 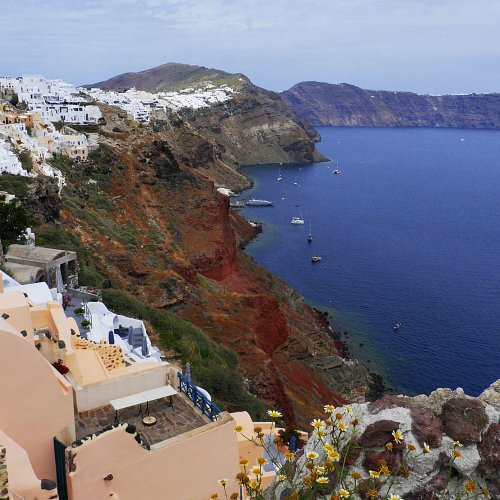 For even more spectacular views, ascend the steep steps to the traditional Greek village above and do not forget your camera. 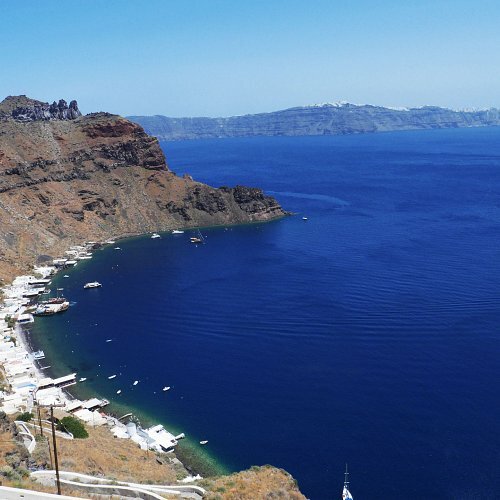 The afternoon involves a short trip towards Santorini island and a 2.5K swim in the peaceful Mouzaki Bay, a stretch of coast only accessible via boat between Oia and Fira. 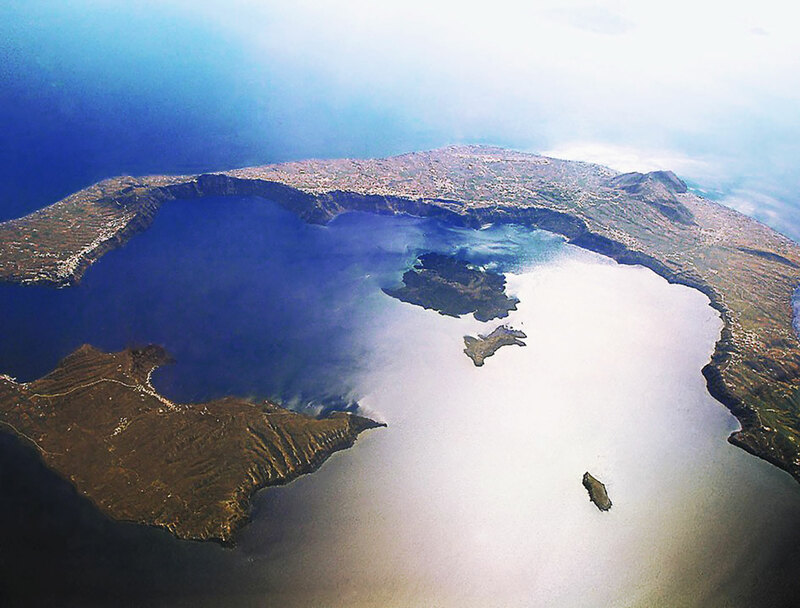 Today we will visit the small volcanic island of Palea Kameni with its hot springs, incredible rock formations and unique mineral water that is said to do wonders for your skin. We will circumnavigate the ‘black’ island which formed during an eruption in 200 BC and complete a 3K swim, finishing in the hot spring bay with unusually warm waters excellent for any aching joints! Whilst swimmers rest and replenish their energy with various snacks on the boat we travel north to the foothills of Oia Town, Ammouthi for lunch where we rest for 1.5 – 2 hours, also known as one of the most picturesque ports in the whole of Greece as it has fantastic views of the caldera and the surrounding islands. 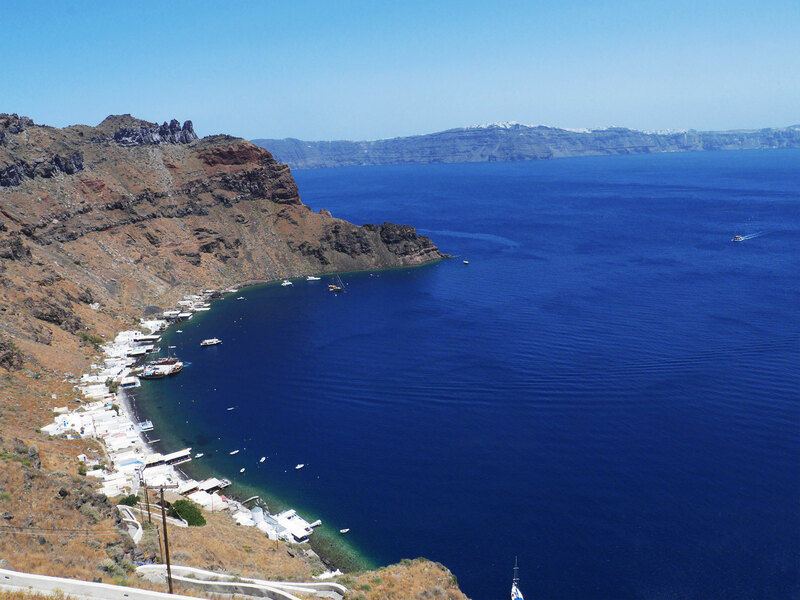 We then board the boat and head towards Thirasia island, where we begin a 2K coastal swim with views of Santorini’s dramatic cliffs and traditional white-washed villages perched above. Early evening visit to the nearby Santo Wines for a wine tasting session, overlooking the caldera. Location: Palea Kameni Volcano & Thirasia island. 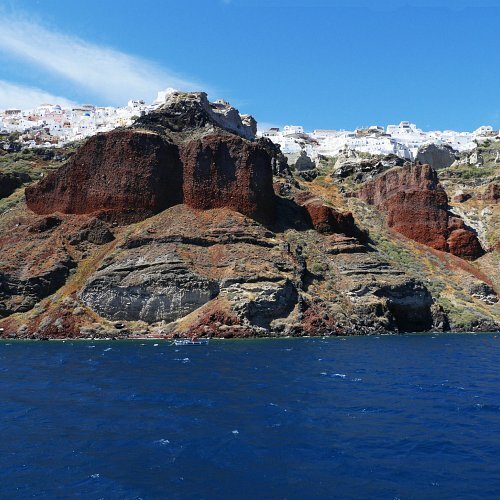 Today we take the 20 min boat ride to Nea Kameni Volcano, the quintessential landmark that defines Santorini, a volcano which erupted some 3,600 years ago. This eruption contributed to the demise of the Minoan civilisation in Crete and shaped the future of eastern Mediterranean cultures. This once in a lifetime swim involves swimming the 3K around the volcano. When we complete the swim, we moor our boat at a designated bay and visit the volcano’s many craters on foot. After this extraordinary experience we board the boat to head to the quiet harbour of Riva on Thirasia island for a well deserved lunch. The afternoon 2K swim is along Tripiti peninsula (a popular scuba diving spot due to the water quality) on South Thirasia island. 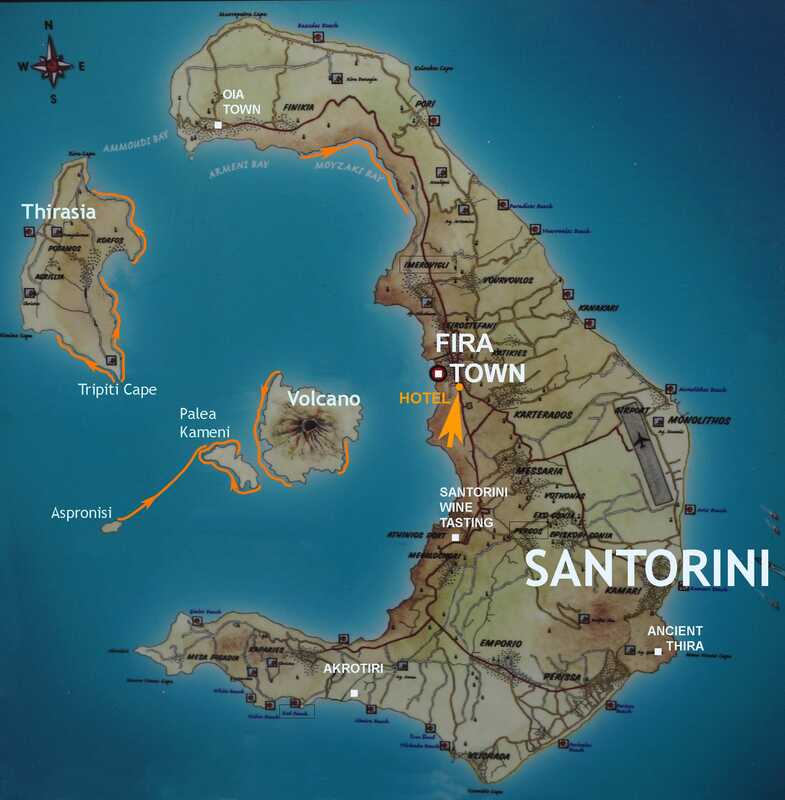 Location: Swim around the volcano & Tripiti Cape on Thirasia Island. 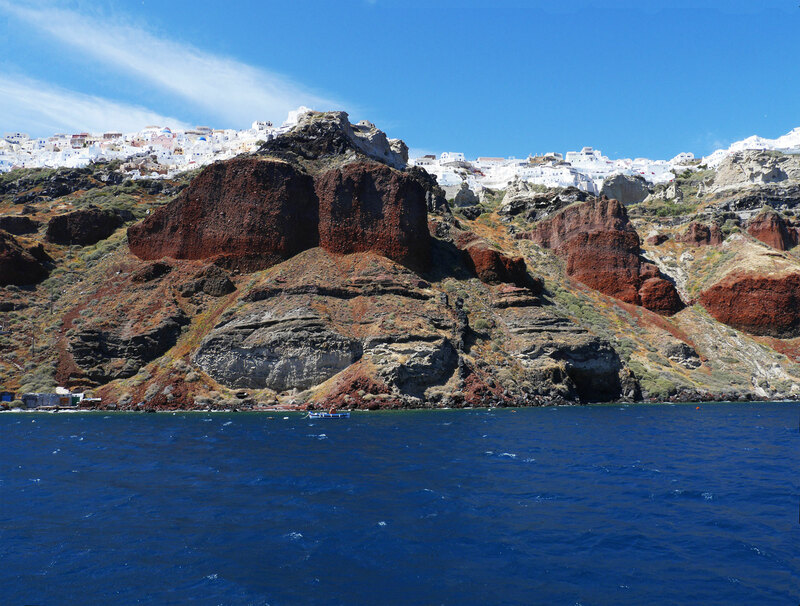 Today unfolds with a short boat journey to the uninhabited private island of Aspronisi, the white island, which possesses fantastic views of the Caldera. This is the only crossing during the trip and will provide a welcome alternative. 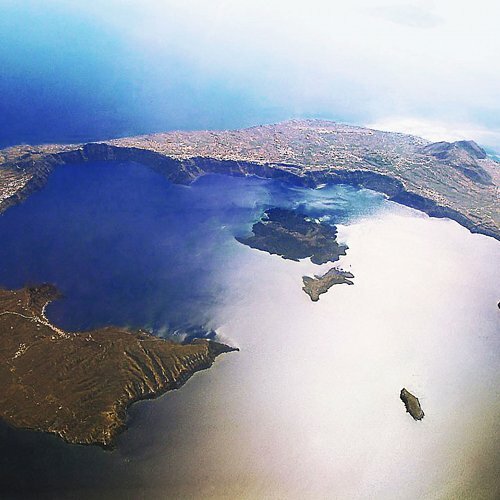 The swim starts east of this small deserted island and you will have the chance once more to view the volcano, Thirasia and Santorini unfolding at a distance in a cascade of colours and dramatic shapes. This 3K crossing will end just north of Palea Kameni, the smaller volcanic island. We will lunch once more in Korfos harbour and at the top of the hill you will have the option to visit Manolas, a traditional Cycladic village, with its square white washed houses and narrow cobbled streets. 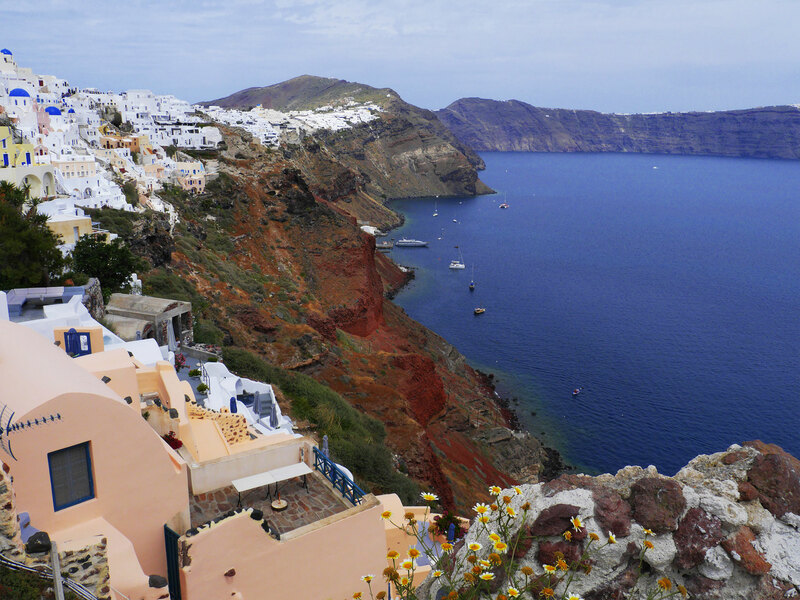 Manolas possesses beautiful views of the caldera due to its high position. The afternoon swim will start at the Tripiti cape exploring Thirasia’s fascinating coastline. This swim will end 2K later at the beginning of a large bay. Location: Aspronisi, Volcano, Thirasia island. This exceptional few days of swimming has gone too fast and it is our final goodbye, “sto epanithin” (until we meet again). This is the last morning in the accommodation and swimmers are asked to vacate rooms at El Greco Hotel & Spa for 12 noon. However, we would recommend that you stay for a little longer to truly explore this unique island; please ask your guides Michael or Noa and they will be able to recommend places to go for cultural visits, unique sunsets, wine tasting, exceptional restaurants, quintessential Cycladic architecture and more, alongside places to swim of course. We will also need to know the times of your flight back so that we can organise the free transfer from the hotel to the airport. If guests are staying longer in Santorini then we can offer preferential BIG BLUE hotel rates to our swimmers at the El Greco Spa Hotel, so please organise your time after the swim trip early enough and let us know if you need our assistance in organising hotel accommodation. 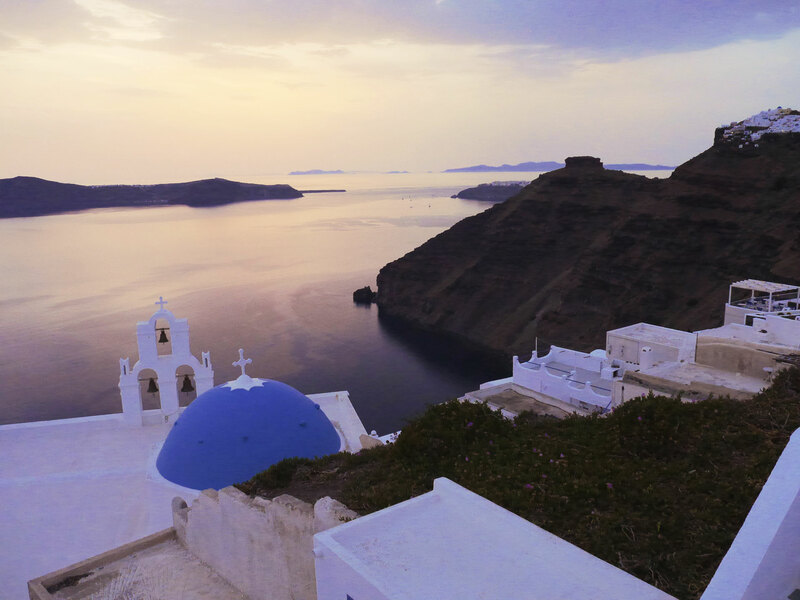 You can fly direct to Santorini island from a variety of different European and non-European cities as this is a world renowned destination. We will be running the swim trip in October and a variety of flight companies operate this route quite frequently, including EasyJet which services this destination frequently throughout the week from London and other U.K cities. 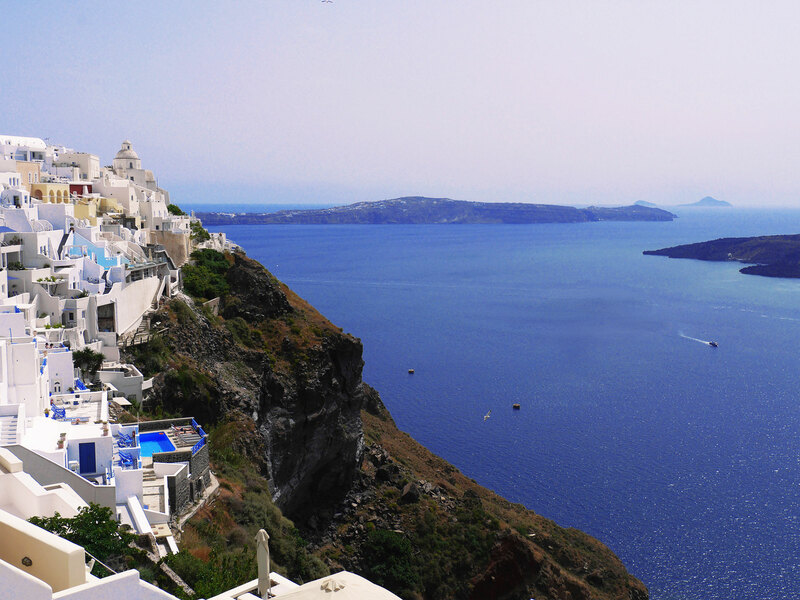 Also swimmers can fly via Athens and a flight from Athens to Santorini is around which is only 20 mins. Other usual operators would be Thomas Cook and Thomson from various UK locations. 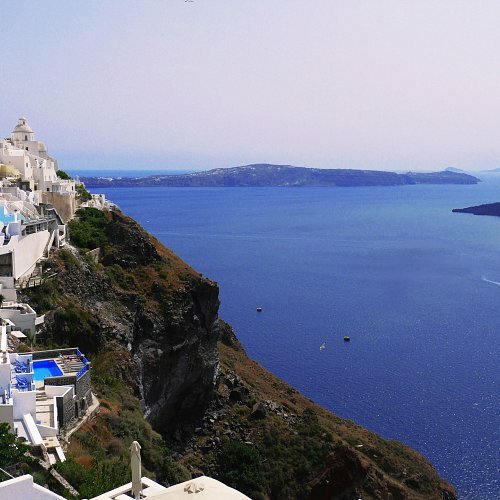 For more of an adventure, you can also get to Santorini via sea from Athens (Pireus Harbour), on a number of ferries. Free transfer from the airport to the hotel and back is included as part of the trip. 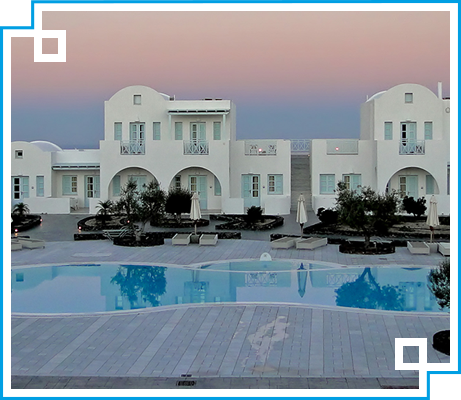 From extensive research we have found one of the best hotels in Santorini for our Big Blue Swimmers. El Greco Resort is a luxurious 4 star hotel with stunning views of the volcano and the caldera. It offers facilities including lush American-style buffet breakfast, 4 swimming pools, open-air Jacuzzis, restaurants with specially sourced chefs, a free fully equipped gym, spa with a variety of treatments, free wi-fi and much more. The traditional Cycladic architecture compliments the recently renovated beautiful interior design of each of the rooms.